When Kiddo first started reading chapter books I spent a lot of time combing the library shelves and reading book review blogs looking for quality books. I always let Kiddo choose his own books, but that doesn’t mean I don’t put a few a lot of books right under his nose. If I didn’t he would be reading nothing but sports facts (not that there’s anything wrong with that!). I admit I’m not a literacy expert, but as an interested parent, I have learned a few tips about choosing books during my hours at the library. A good clue is the age of the protagonist. Is the main character the same age as your child? If so, then likely the book is a good match. Make allowances for children who learn to read at a late age. Size of type. Books with larger fonts are geared towards younger children. Density of illustrations. The more illustrations the younger the audience. This does not apply to all books, of course. Graphic novels are the exception as well as a new crop of books based on the Wimpy Kid model. Illustration-heavy books are good choices for reluctant readers. Color illustrations usually indicate an easier reading level. Easy readers have color illustrations, as do many transitional chapter books like Rabbit and Robot: The Sleepover. Length of book. 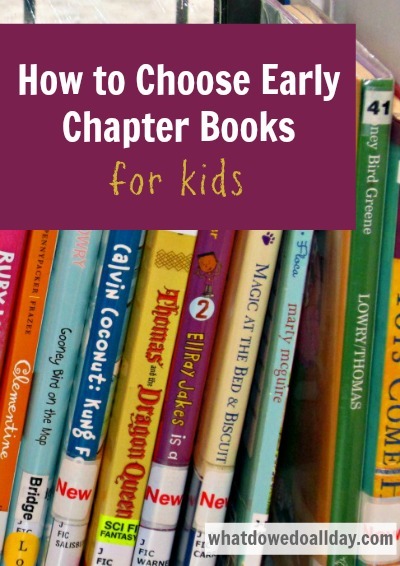 Most early chapter books are 100 or fewer pages. If you find an author you like, look for more of their books. Authors often write multiple books for the same reading level. Kids naturally self-censor. If a book is too difficult, they will put it down. If you find your child has started reading a book that is too challenging for him, don’t despair! Simply choose a new book or read it along with him. Kids will resist reading if you push them too hard (in my experience). Here’s a bit of a teaser video for you! If you’re still having difficulty finding appropriate books use my fail-safe technique: ask a librarian! Do you have any tips to add? Leave them in the comments below so we can all share and learn! Great tips! Thanks for sharing. One of the great resources at our local library is a list of books arranged by reading level. The library uses the same reading level scale as our school system, so I can easily look for books that are at the right reading level for my kids. I expect other libraries may do the same. I’ve never seen a library arrange books that way. Sounds great. These are excellent tips. My son really likes graphic novels, so I’m trying to learn more about that genre. Graphic Novels are what got our son reading! At our library, we can search online for “graphic novels” and then we put them on hold to pick up later. Content is a major issue as our son’s is only 7 and sensitive in some areas. Enjoy the journey. Some of the graphic novels are really good! In general I use the same tips, plus trying to find something that would match my daughter interests. Right now she is all over Boxcar Children and goes through them like she did with Secrets of Droon. I would also add that the length of sentences and the amount of dialog affects reading level. Some novels/chapter books begin with a character talking and right in the middle of the action. Sometimes this is confusing for children. One thing parents can do is to read aloud the first chapter or two so children have the character and setting info. and then let them go on by themselves. Yes, I agree! Very good tip. Thanks, Jocelyn. The problem I have is that I have an advanced reader and I find it difficult to find age appropriate content that challenges his reading. He is 8. Any ideas? Erin, that is my situation at present, too. 8 year olds are just on the cusp of reading middle grade novels. With my son I’ve started looking at award lists like the Newbery and Cyblis. Also classic kids chapter books tend to have more complicated sentence structure and vocabulary than contemporary counterparts so look for books in that category, too. I still always look at the age of the protagonist. If the age is 12, the book is probably not age appropriate, but reading the jacket tells me a lot about if the book is going to be too scary or mature. My 8 year old really enjoyed The Enormous Egg, recently, a book written in 1956. The Castle in the Attic might be another good book to try. Andrew Clements is a good contemporary author to look for. We use the Lexile scores. Every book has one & a good library has books arranged by score. Most libraries indicate the score on the outside of the book like schools do. My kids know exactly where to look and where not to bother. The only downside is that while that method is standard for elementary grades, not all upper grades do it. Interesting, Libby. Thanks for your comment. Maybe you are referring to school libraries, but don’t think libraries which arrange books by means other than Lexile scores are not good. Like other tools (incl. the ones I’ve mentioned), Lexile and other leveling systems are useful, but not prescriptive. LOVE LOVE LOVE this thank you!! I have been struggling with that fine line between encouragement and pushing too hard with a 5 1/2 year old girl who likes books but is frustrated easily when she can’t read all the words. Your tips are so easy to remember, thanks! Also, I shied away from the Diary of a Wimpy Kid series because I didn’t want my daughter to associate herself with “wimpy” – but I never even looked into the book. I’ll give it a shot and I *know* she will love that Rabbit and Robot book – anything with bunnies grabs her attention. Thanks!! These are good tips. I would also add that as your child begins to read early chapter books, it is important to continue reading aloud to him/her. We should help young readers understand the value of reading by reading books aloud that are too challenging for them to read indepently. The 5 finger rule is also worth remembering: if your child makes 5 mistakes on a page, the book is too difficult. My 5 year old has always gravitated towards books with nice illustrations. He tends to like art as well so now that we’re getting into easy chapter readers, I make sure to buy ones that have nice color illustrations. We have been doing a lot books that could be considered both early chapter readers and graphic novels. And if something might be too difficult for him to read at the moment, I read it to him aloud at story time. I have caught him many times subsequently trying to read these books on his own. He is really into Princess Pink and the Land of Fake Believe and the Ricky Ricotta series right now. He also loves Ninjarella – the other books in that series are too mature I think but this one is fine for a 5 year old. And Rabbit & Robot. Both my kids enjoyed the Ricky Ricotta series, too. I just came across your website from my FB. Thank you so much for sharing these tips. 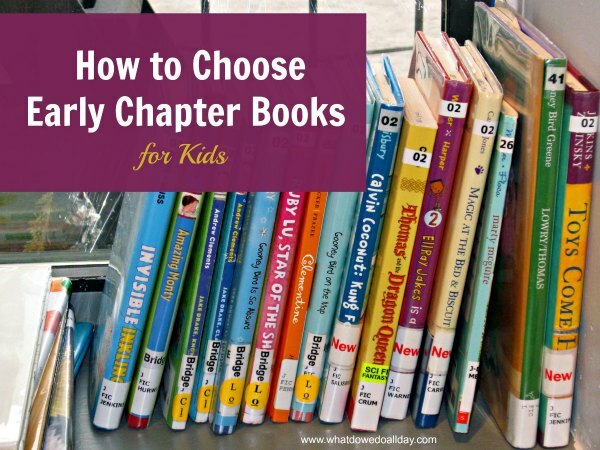 My daughter who is 6 years old just started with her chapter books and I was wondering how to select a good/appropriate book for her. Your tips are really going to help me. Thank you.